Preheat oven to 350 degrees. Beat all ingredients together at low speed with an electric mixer until blended. Increase speed to medium, and beat 2 minutes. Pour into 4 lightly greased mini loaf pans (pan should be about half full). Bake at 350 degrees for 30-45 minutes or until a toothpick inserted in center comes out clean. Cool in pan on a wire rack. I made this recipe 9 times to make 36 loaves and was done in about an hour (not counting cooking and cooling time). I cooked 12 loaves at a time, so it took around 45 minutes for them to get done. I baked the loaves in disposable aluminum pans. 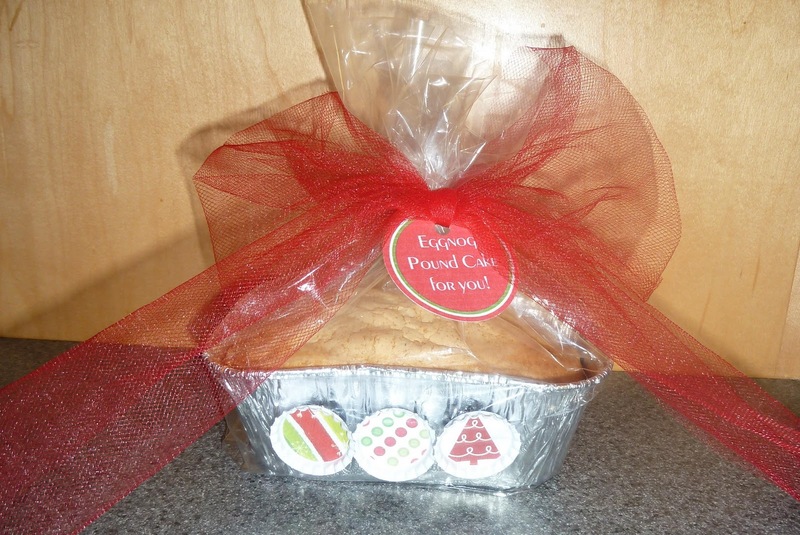 Once they were completely cooled, I wrapped them in aluminum foil and froze them, so I could just take them out as needed for gifts and the cake would still be fresh. The total cost came to $1.60 per loaf (including the aluminum pans and all ingredients) - not bad at all! I did have an extra cake for a family taste test and YUMMY!! The day before I wanted to give the loaves as a present, I would set out to thaw. 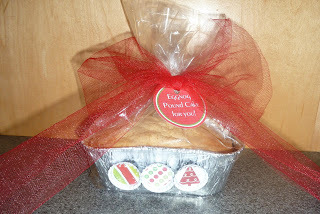 Then, I would put 3 bottle cap magnets on the aluminum pan (Click for MAGNET INSTRUCTIONS), put the loaf in a bag, tie with red tulle ribbon, and then attach a tag that said "Eggnog Pound Cake for you!" (Click HERE to download the tags.) It turned out so cute! This was such an easy and cheap way to make mass quantities of gifts - I may have to do this every year!